The coastal road in Jeddah, Saudi Arabia. 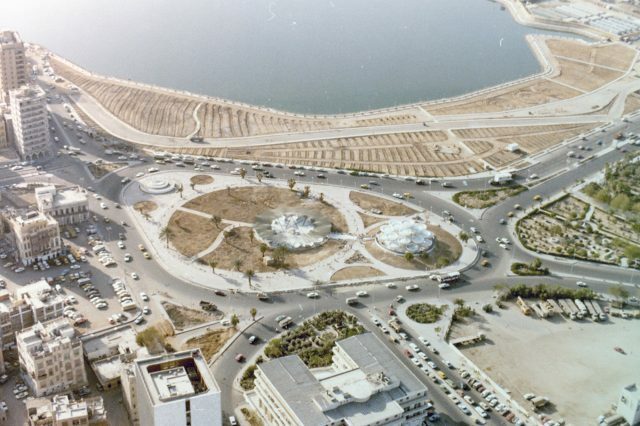 Dr Mohammed Said Farsi working on plans for the Corniche. The Farsi family office is named Corniche to reflect the approach it takes to its wide-ranging interests. Just as a corniche provides a path along a precipitous route, so Corniche provides the vision and leadership to ensure its projects reach their destination safely and successfully. 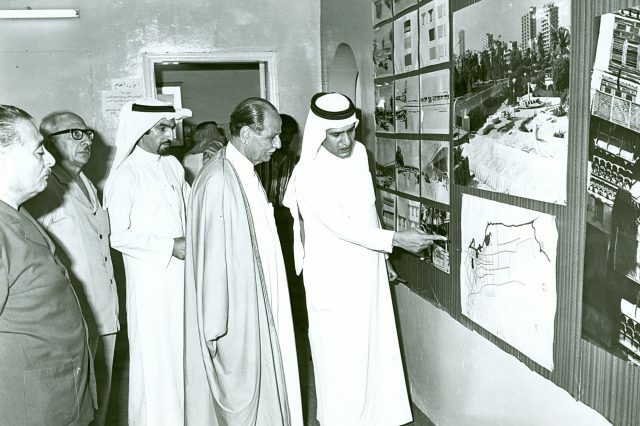 The name also honours Dr Mohammed Said Farsi; a visionary civic leader and philanthropist who did much to shape modern Saudi Arabia, first as a planning officer and then, from 1972 until 1986 as mayor of the coastal city of Jeddah. He created a unique public space where the citizens of this bustling cosmopolitan metropolis could come together to enjoy their city; a broad and sweeping boulevard that traced a path along the coast. As a piece of urban planning it transformed the character of the city. But more than that, he turned it into an open-air art gallery commissioning hundreds of major monumental works from the great modern masters, many of whom were his personal friends. It was a space the city could be proud of, a space that he called the Corniche, evoking at once the beauty and the artistic legacy of the South of France. Under the leadership of his son Hani, this passion for the creative arts remains as strong today as it did then. Hani Farsi, Founder and CEO of Corniche. Until the age of 15, Hani lived in Jeddah but travelled widely with his father before joining South Kent School, Connecticut and the American University in Washington DC, graduating with a BA/ Masters in International Affairs. He continues to play an active role at his alma mater and has served on the board of trustees since 1996. After graduation, he worked in the Washington office of Amnesty International and then moved to London in 1993 to catalogue the family art collection and begin strategic leadership of the family’s assets. From 1993 until 2000 Hani sat on the board of the Donmar Warehouse Theatre, personally subsidising the acclaimed London theatre and saving it from closure until Lottery funding was allocated. From 1998 he invested in the burgeoning field of London restaurants and membership clubs, building up the largest shareholding in the Soho House Group, before selling to Richard Caring, Caprice Ltd, in 2007. Hani is also a successful theatre and film entrepreneur whose investments and credits include award-winning feature films and celebrated documentaries. Hani has worked with some of the world’s most renowned directors, actors and artists. Hani Farsi is committed to continuing the philanthropic work of his father Dr M S Farsi. 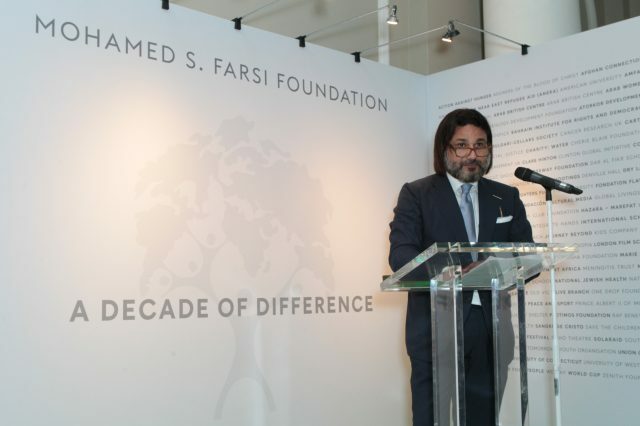 In his honour, Hani founded the M S Farsi Foundation in 2009 to perpetuate his work in supporting the advancement of healthcare, cultural awareness, education and environmental protection. So far, the MSFF has supported projects in Asia, Africa, Europe, Middle East and The United States. Hani Farsi became a British citizen in 2003.